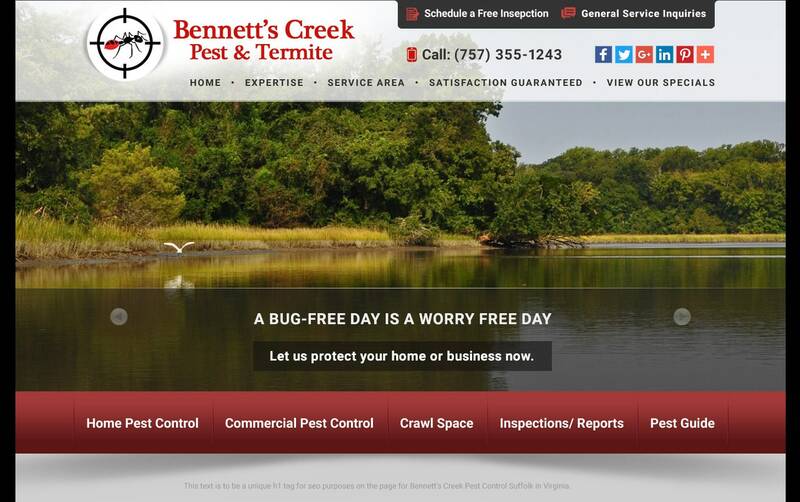 Website Design for Pest Control Business | This is a custom Word Press web site for Bennett’s Creek Pest, Suffolk VA. The site has iconic bug scrolling linkng to a pest control information center. The home page and interior pages feature focus box graphics for the 3 primary service areas to interior pages. We know that when you come to us for a website your looking for a sales and lead generator that has staying power. We get that. You want a beautiful design that speaks to your brand but you also want to take your business to the next level. And we get that too. VISIONEFX provides the finest in Web Design for business and web design to companies and small business throughout the state of Virginia. When searching Web Design Suffolk VA look no further than the web development professionals at VISIONEFX. VISIONEFX, a Web design company based in Virginia and provides some of the best web site design services on the East Coast and throughout the USA. We provide services to national companies to include; custom web design, e-commerce, Word Press web design, search engine optimization services and web maintenance services.